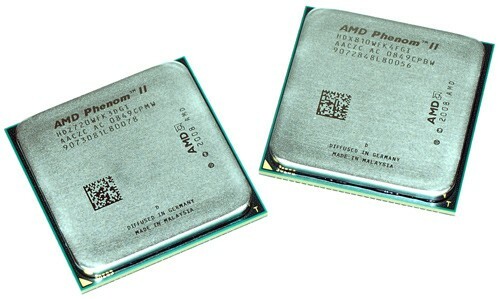 Just a month after AMD launched its Phenom II CPUs and Dragon desktop platform, the chip maker is hitting back with five new processors in the quickly expanding line. The newcomers include the planet’s first 45nm triple-core CPU and three more quad-core siblings, all of which can operate in either AM2+ or AM3 sockets. As for performance? We hope your expectations haven’t been set too high, as the chips were generally found to be just “a logical extension of [the company’s] piecemeal upgrade plan and a fill in [the] gap to its lineup.” Reviewers across the web were generally pleased but underwhelmed by test results, with HotHardware noting that “overall, Intel still has the performance edge clock-for-clock and core-for-core.” In fairness, these chips were found to be good for overclocking, and for the right price, we could certainly see a few gamers giving them a go. For the full spill, dive on into the deep, intricate reviews below. This entry was posted in 45nm, AMD, CPU, Overclocking, Phenom II, Quad-Core, Triple-Core. Bookmark the permalink.